With that being said, you may have noticed the changes in your WordPress Post Editor. Let’s look at the two obvious ones. I like it. Now I can see the colors more easily. There were a lot of shades before, which some may have enjoyed. Sure I did too, but now we have the added option of the next thing. 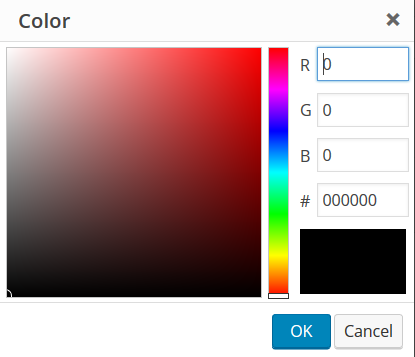 You can change the numbers or click in the rainbow like color bar and then use your cursor to move around within the color box to find just the shade you like. We may have fewer shades preset but now we have so much more available to us. Next up is the one that freaked me out at first. Yes, I got freaked out. Okay, I didn’t but it was weird for a moment. When you clink on the Link Icon up in the tool bar of the Post Editor, you now get that lovely little URL Box you see at the bottom of the image. 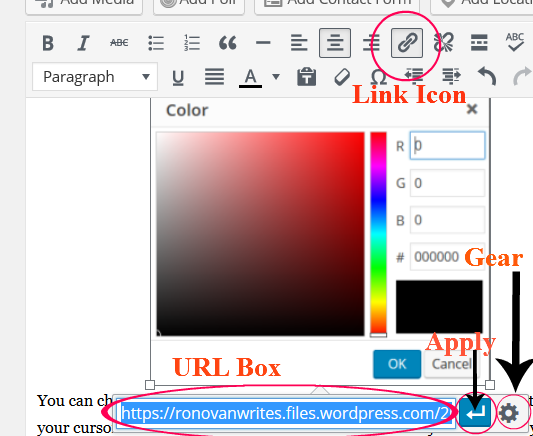 When you are inserting a URL link in your post, like you might do with my Haiku Challenge, you highlight the words and click the Link Icon and then click the little left facing right angled arrow next to the URL box, it’s called Apply. You see it above in a blue box with a white arrow. A little round spoke gear looking thing is just to the right of it. But you might need to insert a URL into a word or into an image. That’s what we look at next. This isn’t all that complicated. It’s just an expanded version of what we had before. You get to this by clicking that little spoke like gear next to the Apply arrow I mentioned before. I like this because you get to see a list of recent posts you may want to link to, and it has that nice Search box as well. Hope this helps someone. If you have any questions, leave them below in the comments, or fill out the comment form. Remember to CLICK IT and GET IT. for a FREE copy of my debut novel. ← New Additions to my Site! Thanks for the tips Ron. I hadn’t noticed, but thanks for the info! I think this is one of the reasons why I (and many other bloggers) recently lost pingbacks and reblog buttons. However, these changes are great and thank you very much for explaining them to us. 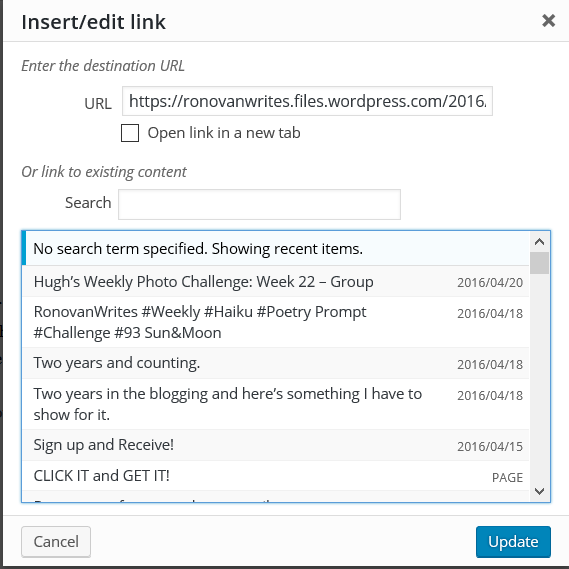 Here is a great post summarizing updates to the WordPress post editor. Have the Happiness Engineers little upgrades have you confused?? Worry you not.. Ronovan Hester has a tutorial… bring some colour to your cheeks and to your posts..